Providence, RI (6/23/2012): The Rhode Island Reds Heritage Society and the entire hockey world are mourning the passing of Hockey Hall of Fame defenseman Ferny Flaman on Friday, June 22, at the age of 85. “Our Society is saddened by the passing of Ferny, a man who dedicated his life to hockey and late in his playing career played an important part of the old Rhode Island Reds of the American Hockey League from 1961 through 1966,” said Buster Clegg, president of the R. I. Reds Heritage Society. With the Reds he served three seasons as player-coach and two more as general manager. Boston Bruins President Cam Neely expressed his sympathies for the Flaman family, as well as the organization's admiration for the New England hockey legend. “The Boston Bruins are very saddened to learn of the passing of Ferny Flaman," said Neely. "Ferny will always be remembered fondly in Boston for his time as the captain of the Bruins as well as the impact he had on hockey in New England after his playing days ended. Known for his physically imposing style of play, Flaman began his career in Boston in 1947, anchoring the Bruins defense until being traded to the Toronto Maple Leafs in 1951, when he helped win a Stanley Cup for the Leafs in his first season with the club. The hard-nosed defenseman found his way back to Boston following the 1953-54 season, and wore the ‘C’ for four seasons with the Black & Gold. 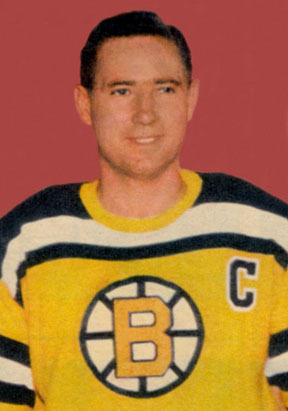 Flaman was named to the NHL Second All-Star Team in 1955, 1957, and 1958 before retiring in 1961. In 910 NHL games, he finished his illustrious career with 34 goals, 174 assists and 1370 penalty minutes. Flaman’s legacy in New England extends beyond his days in a uniform, as he served as a player, coach, and general manager with the Reds of the American Hockey League. After being named to the Rhode Island Hockey Hall of Fame in 1965, he became the head coach and general manager of the Los Angeles Blades of the Western Hockey League and then Fort Worth Red Wings of the Central Hockey League, before returning to the B’s as a scout in 1969-70. Perhaps Flaman’s most successful coaching endeavor was his tenure as head coach of Northeastern University men's ice hockey team – the Huskies - during which he was the ECAC and NCAA coach of the year in 1982, capturing an ECAC Championship in 1988. He also coached his Huskies to four Bean Pot Tournament championships. Over the past 10 years he served as a regional scout for the New Jersey Devils. In 1990, Flaman was honored for his countless achievements and contributions to the game, as he was elected to the Hockey Hall of Fame in Toronto. And most recently he was awarded the NCAA Hobey Baker Legend of Hockey for 2012.